Yield to the gate. The interruption to the cycle route pictured above is in striking contrast to the N81 dual carriageway alongside it, which is focused on free-flow and has a 7 lane junction just east of this location above. This area of the N81 has been feature before on the Irish Cycle Facility of the Week on February 10, February 23, March 10, June 9, and June 23. What if you have one of those Cargo Bikes a Bakfiets also with Children you will not be able to use this Cycling Facility. Instead you will be forced to use the N 81 Dual Carriageway with streaming Traffic. They really need to get rid of these Gates . What could possibly be the intention of this? It is not in line with the pedestrian path so it does not look logical for any user. This is just another anti cycling device widely used by County Councils to discourage cycling. 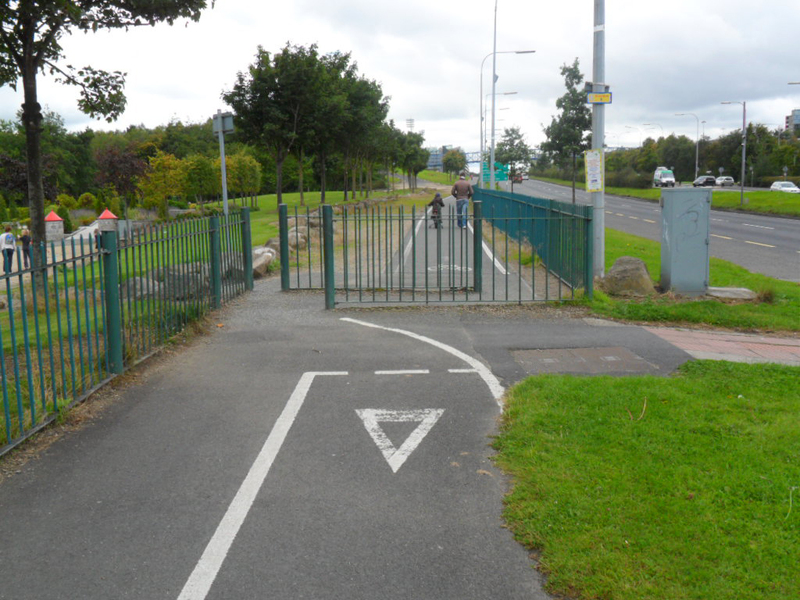 There is one at Springfield park, near Deansgrange which was allegedly installed to prevent motor cyclists from using the route as a rat run, but realistically its a “baby out with the Bath water” devise to make all but pedestrian traffic difficult to cross.